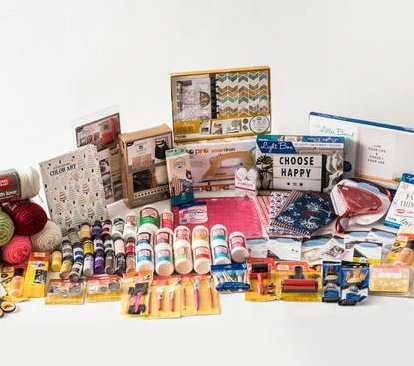 Grand Prize is a $1,000.00 in Products from Premier, Simplicity, Sakura, Plaid, Fairfield, Leisure Arts, Monaluna, Red Heart, Oliso, Scrapbook Adhesives by 3L, Westcott and FloraCraft. Products from Premier, Simplicity, Sakura, Plaid, Fairfield, Leisure Arts, Monaluna, Red Heart, Oliso, Scrapbook Adhesives by 3L, Westcott and FloraCraft. Win a $1,325.00 spring bag package featuring a Biore gift bag, Burts Bees gift bag, Six Pack of Beautiful BROO hair care products, Bulova Rubaiyat Watch, $100 Nine West gift card, Dooney & Burke Bag, Various Tangle Teezer hairbrushes. A lucky winner gets $4,000.00 to spend towards Blu Dot's award-winning furnishings and $1,000 of original art on Saatchi Art. The winner will also receive art advisory services from Saatchi Art's expert curators.